This wreaks of awesomeness. Amazon just launched a new “Original Kids” series last week called Bookaboo, and all signs point to it becoming the new Reading Rainbow. 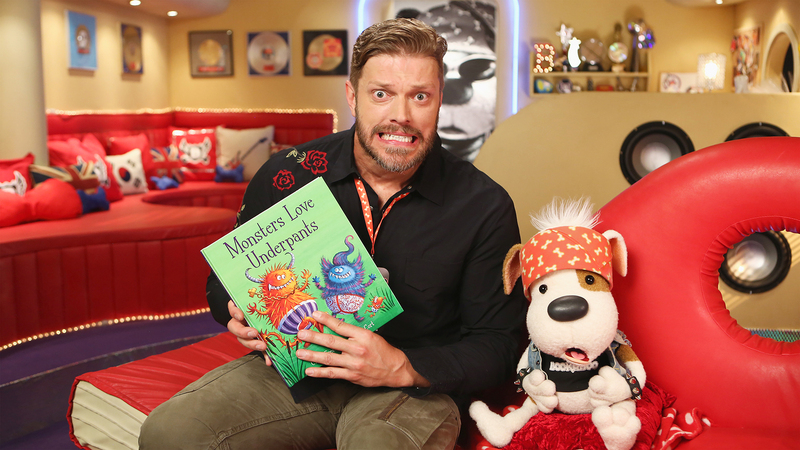 The series focuses on a rock-star puppy named Bookaboo. The drummer tours the world with his band, but can’t play without a story a day read by a different celeb each time out. Paula Abdul, Emily Van Camp, and wrestler-turned-actor Adam Copeland (formerly Edge in the WWE) are among the talents who appear on respective episodes. 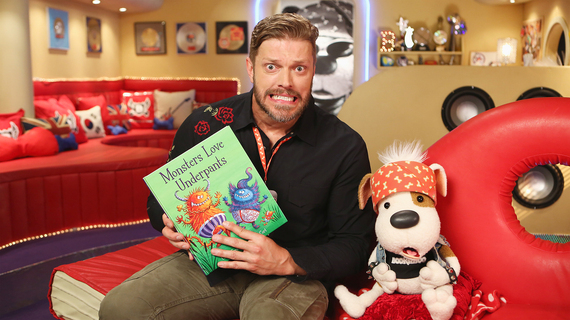 What was the initial attraction to Bookaboo? For me, this was a no brainer. It involves children, a rock n’ roll drumming dog who needs a book read to him, and promotes parental reading and quality time with your children. Sold. It’s been compared to Reading Rainbow. What were your go-to shows as a kid? I grew up in Southern Ontario, so for me, The Littlest Giant was a huge one (Get it? Hey, I’m a dad, I’m allowed bad jokes now. ), Polka Dot Door, Commander Tom (out of Buffalo), Hammy Hamster, The Secret Railroad, and The Hilarious House of Frankenstein. Average. Stayed out of trouble, believe it or not. Loved the arts and sports. Drama, English, art class, and every sport I could play…which explains why I ended up in WWE for so many years. You’re doing a lot of acting lately. Can you describe the rush you get filming scenes on, for example, Vikings compared to your ring work? Filming scenes for something like Vikings gives you more time to study and have choices going into it. They can change at any time because the scene can be blocked an entirely different way than you envisioned, but you can have some sort of idea. Generally, I have a sense when I start a scene how it’s going, but you never fully know until you see the final product after its edited, with music, etc. With wrestling, and I’m assuming theater, you know right away if something is working, and whether you need to switch gears. There’s a rush that comes with both to be honest. How would you describe the current state of pro-wrestling – any personal favorites in the ring? Wrestling will always be sewn in the fabric of pop culture. It will never go away. It will always have its ebbs and flows. I don’t know if it will ever ascend to the mountaintops of the [Steve] Austin and The Rock era again, but that’s no commentary on the talent. Just a sign of the times we live in with so many entertainment outlets. Currently, AJ Styles is on fire and I’m glad he’s finally getting a shot to show what he can do on the biggest stage. I’ve been on “The Revival” bandwagon before they had a bandwagon. Who would your dream opponent be in the ring – fictional or real? I would have loved an Ironman match with Bret Hart, or Texas Rattlesnake Steve Austin vs. Rated R Superstar Edge each in our prime. Or because I’m a comic geek, Daredevil or Deadpool. Totally shifting gears, can you impart some words of wisdom to my nearly two-year-old son? Each week A-Sides unleashes its top 12 tracks of the week AKA the “Delve Into Twelve” based on the following contributing factors: songs I’m playing out that particular week (no matter when they were released — think overlooked songs, unreleased tracks and old favorites), songs various publicists are trying to get me to listen to that I did and dug a bunch, song posts and trends I’ve noticed on my friends’ Facebook walls and, most importantly: what my preschooler is currently enjoying thoroughly with an assist from my toddler.